For years American urban parks fell into decay due to disinvestment, but as cities began to rebound—and evidence of the economic, cultural, and health benefits of parks grew— investmin urban parks swelled. The U.S. Conference of Mayors recently cited meeting the growing demand for parks and open space as one of the biggest challenges for urban leaders today. It is now widely agreed that the U.S. needs an ambitious and creative plan to increase urban parklands. 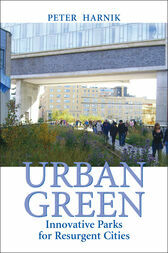 Urban Green explores new and innovative ways for “built out” cities to add much-needed parks. Peter Harnik first explores the question of why urban parkland is needed and then looks at ways to determine how much is possible and where park investmshould go. When presenting the ideas and examples for parkland, he also recommends political practices that help create parks.